We've all seen them, the full-page ads for Amish heaters (where it doesn't exactly say but where, apparently, primarily only the frames are made by the Amish), "rare" coins and bills, etc. While the debate about "native advertising" in digital rages in various forums (punctuated by John Oliver's hilarious takedown of it), the old-fashioned "advertorial" has become more and more a staple (from my observations) for cash-strapped newspapers. But even newspapers have some moral, if not legal, obligation, it seems to me to at least give these things a vetting for being misleading -- and, frankly, from a business sense, too, since this kind of stuff doesn't do much to help your already steadily eroding credibility. Yes, it did use "mini" antennas. But they were in a bank of antennas in a huge warehouse in Brooklyn, for instance. And they were not so much designed to plug into your TV as to enable you to watch your over-the-air free TV stations on your computer anywhere you wanted to. There's no evidence I see that this "slick little $88 device" that "pulls in crystal-clear digital TV channels for free with no monthly bills" does any more than a $15 or $25 antenna from Wal-Mart (or other retailers) that you can plug right into the back of your digitally enabled flat screen. And if you happen to have an old analog TV, you can add a digital converter box for about $35, bringing the total cost to maybe $60 instead of almost $100 with shipping and handling. Heck, one of those boxes will even record shows if you plug in a large-enough digital drive. No surprise here. Universal Media Syndicate, the operation behind these questionable ads, has been the subject of numerous complaints. The only "slick little device" in this ad is the wording. But at what point does a paper like The State have to make some moral decisions and say enough is enough? You no longer can separate the newsroom from the business, as if you ever really could. And that makes it even more important that news organizations -- newsroom, ad, business and corporate -- examine their morals and ethics when it comes to things like this. I suppose your lack of responses may be from those that do not want this dream destroyed. I, for one, for got to place this order (thank goodness) but thought I would research this "too good to be true" ad, first. Thank you for saving my gullibility from my pocketbook. Glad I live in Florida, because I would also have bought an Amish Heater. I, too, was almost persuaded. Now to check out those Amish heaters! Thanks for telling us the truth about these wonderful sounding scams. I like your writing style, too. Thank you! My 76 year old father wanted to get one and I read your response!! 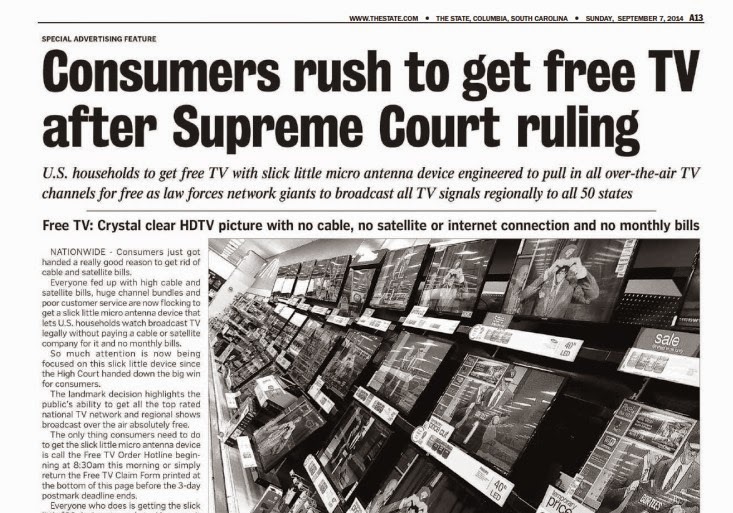 This ridiculous ad appeared in our newspaper today.I paid 25.00 for a whole house antenna that rotates and gets fringe TV. About 40 channels in my area. There is a line in the ad that changes the description from slick to "sleek". Thought that was interesting. These people think they are slick and make me sick - 2.00 device for 88.00. What a scam. Would it be illegal to comment where they should really install thier antenna? Keep up the good work. In this day and age-operators like to take advantage of consumer's gullibility by slick and fancy newspaper ads in getting its clients. Just a simple google inquiry will set one straight and always remember the old adage, if it's too good to true-yep, believe it!!! !